What is “Overdraft”? It is a type of revolving credit extended to businesses and individuals to provide working capital. It allows you to withdraw funds (up to an agreed amount) from a checking account, even when the balance of the account is zero. In other words, an overdraft allows a business to spend more money than it has in its account at a given time. Overdrafts are frequently used by businesses to manage cash flow and cover unexpected expenses that arise. For many small business, overdraft often become the most complex financing option to understand [and analyze] among the other. On the other hand, often, banks are not “so transfarent” on the fee [charges] area. This is a perfectly-bad complexity mixed on the option. This post discusses “Overdraft“ funding option. It comes with essential overdraft funding FAQ, its advantages and disadvantages for the business owners, analyzing the use of overdraft financing with a case example. Sure it is by no meant comprehensive, but it is a good start. Enjoy! Is An Overdraft An Effective Form of Finance for My Business? Overdraft facilities are an effective means of short-term financing for businesses that are in good financial health but experience occasional cash flow problems, such as businesses that operate on a seasonal basis. Overdrafts are also be used to provide capital between the time a business’ bills are due and the time the business’ customer accounts are paid. Overdrafts are not an effective form of finance for asset purchases. Note: In my experience, if a business frequently must rely on overdraft to maintain liquidity, this may be a warning sign of a bigger cash flow problem that should be addressed promptly. And the business should start think of other type of funding [a longer term]. Overdraft financing is easy to secure and provides instant financing when the business’ funds are tight. Does overdraft need collateral? Yes, overdrafts are frequently secured by business or personal assets. If the business is unable to bring the overdraft current through payments, the collateral can be seized. The entire overdraft amount can be recalled by the bank at any time if the overdraft terms or conditions are broken. 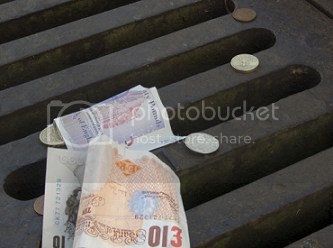 Does overdraft have limits? Most lenders will set a maximum amount by which the account can be overdrawn, also known as an overdraft limit. Exceeding this limit can result in steep fines or fees and extremely high interest rates assessed on the amount charged over the limit. Are penalties assessed for repayment? No. Most overdraft facilities can be fully or partially repaid at any time without incurring a penalty or charge. What kind of interest rates do overdraft facilities carry? Overdraft facilities generally have variable interest rates; however, some lenders may be willing to negotiate a fixed interest rate on the overdraft facility. The effects of overdraft financing depends upon the pattern of cash flows over time. Suppose that the net cash flow for period “t” in the account is denoted by “At“ which is the difference between the receipt “Pt“ and the payment “Et” in period “t“. Hence, “At” can either be positive or negative. The amount of overdraft at the end of period “t” is the cumulative net cash flow “Nt” which may also be positive or negative. If “Nt” is positive, a surplus is indicated and the subsequent interest would be paid to the borrower. Note: Most often, Nt is negative during the early time periods of a project and becomes positive in the later periods when the borrower has received payments exceeding expenses. It = h(Nt-1) for a positive Nt-1. The net cash flow “At = Pt – Et” is positive for a net receipt and negative for a net payment. This equation is approximate in that the interest might be earned on intermediate balances based on the pattern of payments during the period instead of at the end of a period. The account balance in each period is of interest because there will always be a maximum limit on the amount of overdraft available. For the purpose of separating project finances with other receipts and payments in an organization, it is convenient to establish a credit account into which receipts related to the project must be deposited when they are received, and all payments related to the project will be withdrawn from this account when they are needed. If receipts somewhat lag behind payments for a project, this credit account will have a negative balance until such time when the receipts plus accrued interests are equal to or exceed payments in the period. and as soon as Nt reaches a positive value or zero, the account is closed. The MARR of the corporation before tax is 10%. The corporation will finance the facility be using $200,000 from retained earnings and by borrowing the remaining $300,000 through an overdraft credit account which charges 14% interest for borrowing. Is this proposed project including financing costs worthwhile? 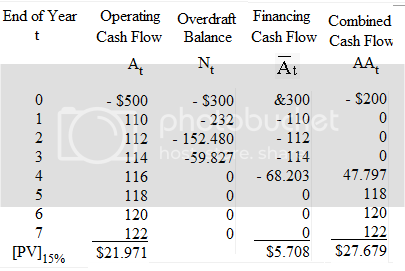 The adjusted net present value of the combined cash flow discounted at 15% is $27,679 as shown in the table. An overdraft fee of $34 for a $3.40 cup of coffee translates into a 1,000% annual percentage rate (APR) if you repay the loan in one year. If you repay the loan in one week, the APR is a staggering 52,143%! Overdraft loans cost consumers $17.5 billion per year, more than the $15.8 billion extended in funds to cover the overdrafts. A small group of consumers is paying the majority of fees. Sixteen percent of overdraft loan users account for 71% of overdraft loan fees. Americans who depend heavily on Social Security income pay nearly $1 billion per year in fees for unauthorized overdrafts. Some banks advertise overdraft loans as a way to make it until the next payday.